GorillaCam is a plugin for Cinema 4D that is designed to work with your existing animated (or un-animated) camera. GorillaCam makes your camera feel like a real person is behind it, not some cold, dead machine. THE PROBLEM: Animated cameras often look CG and robotic. They lack that subtle human imperfection and correcting this with built-in tools can be tedious and time-consuming. Vibrate tags dont cut it and the Motion Camera is way too cumbersome. This plugin is perfect for anyone that wants to create more engaging shots in Cinema 4D but doesnt want to hassle with complicated camera rigs. Every scene has a camera, make yours unique with GorillaCam! GorillaCams smoothing feature can transform even the most jank camera move into a buttery smooth Steadicam shot. GorillaCams Overshoot feature allows the camera to overcompensate in both position and rotation to simulate large-heavy camera rigs. With the Target and Zoom tabs you can easily create lifelike cameras that follow objects around your scene or even a UFO across the sky. Complete with overshoot and shake settings of their own, you can quickly create cameras that feel less CG. Focus overshoot allows you to easily simulate a camera operator searching for the right focus or add some Focus Drift to create add overall imperfection to your focal distance. Think of GorillaCam as a filter that you attach to your original camera. You feed GorillaCam a pre-animated (or still) camera and that becomes the reference camera. That way you are free to add as much overshoot, smooth, and shake as you like without destroying your original camera. A GorillaCam is instantly created and will automatically reference your original camera. Neat! Select the GorillaCam tag and choose your scale. Grab a preset from the drop-down or hit the Im feeling lucky button and away you go! Of course, you can dive as deep as youd like. The Advanced tab has all the power user settings to help you achieve the exact look you desire. Simple Smoothing: Easily smooth out our your existing camera motion with GorillaCams proprietary smoothing algorithm. Works with your existing camera: No need to set up or use complicated rigs. GorillaCam will reference whatever camera you feed it. 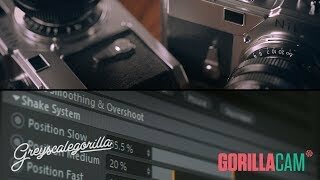 60 GorillaCam presets: Whether youre looking for subtle movement on a product shot, looking to spice up an architectural walk-through, or youre animating an action-packed car chase, GorillaCam has a preset for you. Directable Jolt: Ever watch a cop drama tv show and notice that every so often it looks like the camera person was bumped? This is why we created the Jolt feature. Jolt will allow you to bump your camera operator at specific intervals in time or allow you to specify whatever frames youd like to Jolt your camera. Perfect for anvil head drops or post-apocalyptic explosions. Overshoot all the things: Quickly add realistic overshoot to your cameras position AND its rotation. Camera Target Overshoot: Works with your existing camera target or will create one for you. Zoom Shake: Create 70s crash-zoom effects easily with our Zoom tab. Simple Scale Buttons: Whether youre shooting a cell phone or hovering over a city in a chopper, you can easily change the scale of GorillaCam shakes with the click of a button. Non-destructive workflow: Your original camera is always safe and one click away. Simple Swap: Easily look through your original camera with a double-click on the GorillaCam tag. Shift-Click the GorillaCam tag to immediately select your reference camera. Feeling Lucky? Tap the Feeling Lucky button for a unique GorillaCam shake with every click. Three Speeds of Shake: GorillaCam utilizes three shake speeds to create believable camera shake. Advanced Controls for when you need it. Simple sliders for when you dont: We built GorillaCam to be simple for those that need good results fast, but it was also important to us those power users have all the controls they would need to fully art-direct their own GorillaCam looks/presets. Multiple Baking Options: Need to share your scene with an artist that doesnt have GorillaCam or send it up to a cloud-based farm? GASP! No worries, you can easily bake out your GorillaCam and sleep well. You can even un-bake to get all your controls back to where you left them.